CF-WHY - A Recap of the Week! We all know I'm obsessed with children's literature. I've decided to try to do 2 books a month and tie them into different skills I'm teaching. 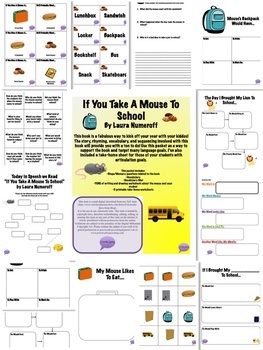 We just finished "If You Take A Mouse To School" last week, using the packet you can find here. I'm targeting "Characters" and "Attributes" as a main topic for our lessons. Falling under that topic are your higher level language skills used to figure out those attributes and characters. We used our noggins to think outside the box and answer questions about what would happen if we took our own pet to school. The kiddos had a blast thinking about what they would feed their pet at school - a personal favorite of mine from a student was a dog named "barbie" who would eat croissants and wear pretty dresses. She was a poodle, naturally. I think words walls rock, so of course we have one for Fall! We're "harvesting" a good vocabulary in my room! Every week I choose a different word from the wall and we dive into our Speech Warm Up using that word - sentences, synonyms, antonyms. Every week when there's a new word, I do a Speech-style game show where we go around and everyone gives me the word of the week from previous weeks. The words are all displayed to jog their memories! Last week my Fall book haul arrived from Amazon - I swear my UPS guy hates my guts! LOL We started reading "Let It Fall" by Maryann Cocca-Leffler after we finished any activities that were left over from last week. You can find the packet we're working with here. This book is awesome, and contains many of the vocabulary words on my wall. I pre-taught the vocabulary, so the kiddos were psyched when they heard "Autumn" and knew the synonym was Fall! We drew conclusions about what season was coming next, and inferenced about why they were doing all these activities! The kids got a chance to chat with their peers about Fall activities that they do - love tying in those pragmatics! We started work on our Fall Attribute Bubble Charts as well. Many of my students were rock stars with these. I tried to push them to think out of the box when it came to describing Fall - lets leave the leaves and branch out into Thanksgiving and Halloween - even a "crisp snap" to the air! Some learning curve balls that were thrown at me this week? The IEP system that I'm used to from student teaching is different from where I work - so I'm asking questions, apologizing if I'm missing things, and being super organized so I finish things early enough to not mess up anything too close to the deadline. I'm finding that if I ask and explain that things are different from where I was, people are happy to help! Never be afraid to ask!